Contemporary London instrumental group Quest Ensemble bring a fresh take to the classical piano trio format. Fusing their backgrounds in western classical, Indian classical, jazz and improvisational technique, the ensemble is an interaction between three versatile players, Filipe Sousa (piano), Tara Franks (cello) and Preetha Narayanan (violin). Quest Ensemble collaboratively create original work, seamlessly blending improvisation with devised composition. Pulling on influences as broad as the contemporary minimalism of John Adams and Steve Reich to medieval plainchant, the experimental malancholic textures of Radiohead to the progressive jazz precision of Brad Mehldau, their lyrical melodic lines, rich harmonies and interwoven rhythmic counterpoint place the trio in a unique musical landscape between chamber, jazz, folk and 20th century classical music. Versatile players individually, and all graduates of the Guildhall School of Music Leadership Programme, Quest’s compositions are part-composed and part-improvised as the trio members interact in rehearsal; layered melodies and rhythmic patterns combine to create contrapuntal webs of sound. 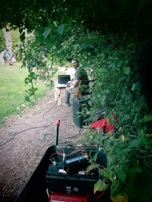 The process involves sharing improvised ideas, building up layers of music on each instrument to create a patchwork of musical themes that is part-notated and partly left for the performance. In this way each performance is different, but always rooted with a rich vein of surging Reichian rhythms underpinning each. 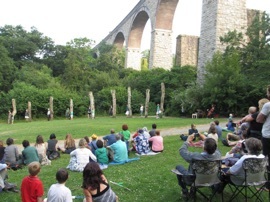 Quest Ensemble collaborates with Choreographer Ruth Pethybridge at the Penryn Arts Festival in a residence and site specific performance with community Dancers of ranging age and experience. 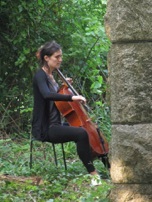 Inspired by the beautiful surroundings of the Penryn Viaducts, Quest worked with sounds from the site and performers, the natural reverberation of the stones, wood and stream and manipulated sounds from the Cello and Violin. 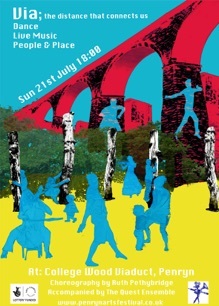 Quest Ensemble works with Visual Artist Lucy Steggals to create a soundtrack for a film and headphone pieces based on audio recordings taken in Blue Town. Colour Mining Blue is a portrait of Blue Town created from data (photographic stills, audio recordings, film clips) gathered in Blue Town, Isle of Sheppey, during Feb/ March 2012 and exhibited in London at the Ground Floor Left Gallery.